The future of the environmental movement lies in the world’s cities. In 2008, for the first time in human history, more of us lived in urban environments than in any other setting. This trend is only going to accelerate as human population approaches the 10 billion (!) mark by the end of the 21st Century. Indeed, almost two decades ago, UNFPA predicted that “[t]he growth of cities will be the single largest influence on development in the 21st century.” Subsequent developments have borne out this prediction. In 2008, UNFPA projected that, on a global level, all future population growth would be in urban areas. For good or for ill, we humans are heading down an urbanized path. In the developing world, the burgeoning growth of urban areas has relegated more than 1 billion people to overcrowded and polluted slums, often lacking basic services such as clean water and sanitation. Even in wealthier, developed countries like the United States, urban settings present a host of environmental challenges for their current and future inhabitants. Our cities tend to have concentrated pockets of poor and minority populations. The political marginalization of these groups, coupled with an environmental ethos that valorized “the wild” over the built environment has too often left these communities behind. Indeed, one of the major insights of environmental justice is that racial minorities bear a disproportionate share of the nation’s environmental bads, while having access to only a small sliver of the environmental goods. Our national environmental laws too often fail to combat this mal-distribution of environmental amenities and harms, and rarely manage to account for the disproportionate burdens on environmental justice communities associated with cumulative pollution loads from multiple polluting sources in urban environments. Of course cities are affected by broader environmental considerations like climate change. But, cities are far more than passive recipients of changes wrought elsewhere—they are the locus of nearly all major economic, social, demographic and environmental transformations. Cities are complex and multilayered environments that exist on the border between the built and the natural, with the “urban footprint” stretching far beyond a city’s political boundaries. As such, this perceived dichotomy between the “city” and “the environment” in the law is increasingly problematic: it is often focused in a fashion that does nothing to combat (and sometimes makes worse) the poverty that can exist right alongside the resource being protected. And an overly-myopic focus on protecting “the real environment” can play into the hands of those interested in reducing environmental protections—allowing them to portray environmental advocates as environmentally unjust, or at least agnostic with respect to justice. There is at least a kernel of truth to this allegation—around the world, the preservation priorities of many large, Western environmental organizations have clashed with the development priorities of local (and often impoverished) communities who perceive hunting and resource extraction on those same lands as their most viable development option. Within the United States, too many urban communities have felt excluded from environmental priorities that focused more on preserving wild lands than on greening the cities. This justice blind spot has limited the reach and appeal of the environmental movement. Worse, it has allowed those opposed to environmental protection to portray environmental law, and environmentalism more generally, as an elitist endeavor. To the extent that urban populations perceive improving the material conditions of their lives to be in conflict with protecting the environment, environmental protection becomes yet another racial and class-based structural bias. There is nothing inevitable about these clashes—environmental protection need not disadvantage the urban (or rural) poor. The environmental justice movement offers a way out of this dilemma. By surfacing when and how environmental laws fail to generate improvements that reach everyone, even despite national statistics showing overall environmental progress, environmental justice highlights the unequal distribution of both environmental bads and environmental goods in a society. Thus, an examination of environmental laws through an environmental justice lens focuses attention on which communities become overburdened with polluting industry and why, while also demonstrating that those same communities are often underserved by green infrastructure, including adequate sewers, clean accessible rivers, parks and greenspaces. Both prongs of environmental justice are vitally important. Urban pollution loads have dramatic health impacts, with children in New York and Washington DC and other urban settings having disproportionately high childhood asthma rates, and blood lead levels. Among the many negative consequences flowing from these adverse health effects is one that too often gets overlooked—health effects of urban pollution loads make playing outside less possible for urban children. Theorists have recently begun to acknowledge the problems flowing from the growing dissociation between children and their environment. The idea of a “nature deficit disorder” has taken root, with Richard Louv’s groundbreaking book “The Last Child in the Woods” sparking an international conversation about the alienation children increasingly experience from nature. Urban ills of crime and pollution only make this nature deficit problem worse. City as an impoverished ecosystem-less wasteland is a fiction—as regular readers of this site know, urban environments are host to a rich array of biodiversity. Indeed, even within NYC’s self-lore, counterexamples abound—witness Andrew Rudd’s recent post about the new species of leopard frog discovered in Staten Island, or the media furor over Pale Male, a red-tailed hawk that has nested for years on a fancy 5th Avenue coop just off Central Park. Yet these kinds of stories are not uncommon. 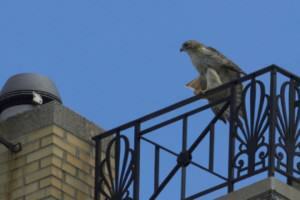 Hawks nest in Astoria Park, Prospect Park, at New York University in lower Manhattan, and Queens College. Indeed, hawks, egrets, cormorants, various species of gulls, possums, raccoons and snails are just the most visible edge of a rich biota that even includes large predators like coyotes. 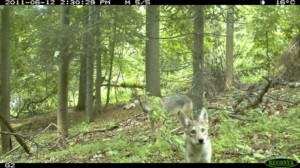 Coyotes in an undisclosed location in New York City. Photo by Mark Merkel. Organizations working with young people to green their current urban environment have demonstrated that teaching children about their own environment reaps tremendous dividends, empowering children to work to change their environments while simultaneously sparking their interest in science and the environment. Global Kids, an NGO that works with at risk youth has reported that participants in their Environmental Justice Summer Workshop program have improved school performance and self-esteem, even as they work to make real changes in their environment. 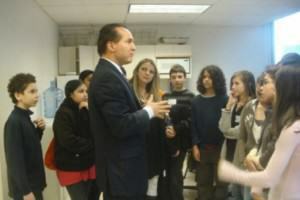 Councilmember Peter Vallone with PS122Q students. Photo by Donnelly Marks. Advocacy and research by school children at PS122Q prompted NYC City Council to pass a “no idling” ordinance which limits bus and truck idling in school zones. GrowNYC’s Grow to Learn school gardens transform asphalt schoolyards into gardens that teach students about environmental sustainability and healthy eating. Even these modest initiatives pay huge health and environmental dividends, and these programs help build the next generation of environmental leadership. This is why a vital component of greening our cities must be youth education—and education that does not just take place in a classroom. New York City has a number of interesting initiatives tying environmental justice initiatives to environmental education and environmental protection. Target planting neighborhoods for MillionTreesNYC. One of the highest profile is the MillionTrees initiative that NYC is undertaking as part of PlaNYC—New York City’s ambitious plan to reduce its carbon emissions by 30% by 2020. 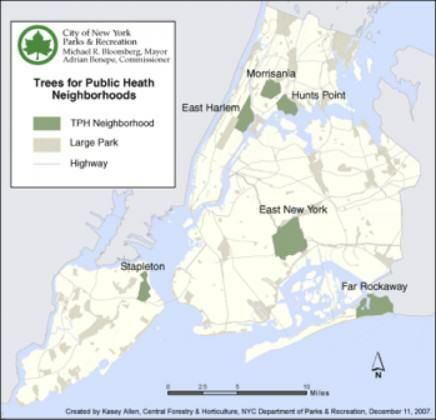 As part of this initiative, New York City is preferentially planting trees in six environmental justice neighborhoods that the Parks Department identified as neighborhoods of greatest need for trees. These six neighborhoods were selected because they have fewer than average street trees and higher than average rates of asthma among young people. The hope is that additional trees will help reduce the pollutants that trigger asthma, and will also make the area more inviting to residents. Community outreach and education around tree planting also provide an opportunity to teach urban youth about trees, while expanding the urban forest provides habitat for birds and other creatures, reduces the heat island effect, and marks a step toward addressing the nature deficit.